This was a Slovak Spectrum clone made by Didaktik Skalica Ltd. in communism times (1987). It offered 80 KB RAM. As all Z80A based computers, it was not possible to address more than 64k. So the Gama computers used a bank switching technique, with two 32k additional RAMs. There was even a LED on the case, which indicated if the RAM have been switched or not! The Gama computers had a built-in paralel i8255 interface. They used the original Ferranti ULA and had russian made memory chips. 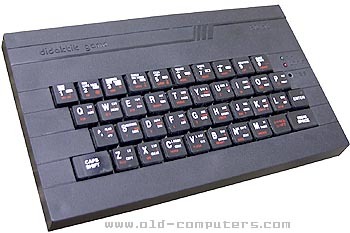 The Gama computers were not fully compatible with the original Sinclair Spectrum due to some system variables differences. In fact several models were made. - In 1988, the Gama'88 was launched (grey case). It's main difference is that the bank switching bug was repaired. - One year later, the Gama'89 (guess why) was released because the '88 model was still quite buggy. Some bugs in ROM were corrected and hardware was a little bit changed, so the compatibility was improved. It has only latin character set and a print routine was implemented in ROM. The Gama'99 was the last and the best model of the Gama serie, it was manufactured up to 1992. CPU Z80A, ROM 16k, RAM 80k bankswitched, graphic mode 256x192 with 8 colors, text mode 32x24. Two bottom lines were reserved for interpreter. Sound 1bit beeper. I/O ports : TV OUT, VIDEO OUT, TAPE IN/OUT shared with POWER SUPPLY connector. Expansion slot and 8255 interface. Power supply is external and offers +5V and +12V. The memory banks switching in GAMA was used for "tricks", like enabling on GAMA the AY sounds and music in games designed originally for ZX 128, taking game screenshots, enhancing the copy programs and many more things. see more Didaktik Gama Ebay auctions !